The joy of Eugene Edebiri Olague and his wife Osarunwense Juliana was endless, during and after the conclusion of all marital vows they both made legally, traditionally and more importantly at the altar. 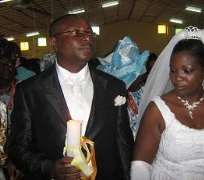 The eventful and colourful wedding took place at Benin City, Edo State, (Nigeria) on the 23rd and 25th of July 2009. After the completion of church activities in St. Augustine Catholic Church (Benin City) Pa and Mrs. Bob Uwadiae Woghiren (brides parents) could not hold back their excitement; they described the success of the wedding as a divine gift and rare privilege bestowed on their family, the two parents profusely rained prayers on the couple declaring that they will not regret the marriage and that God will bless them with all what marriage deserves, financially, materially etc. Similarly, Mrs Queen Akinlaja, elder sister to the groom spoke with modernghana on behalf of her parents Pa and Mrs Osa U. Olague (groom's parents) said Eugene is a man who has fear of God, humble, dedicated, hardworking and caring. She further said the wife has no course to regret the choice of marrying her brother, affirming that Juliana has married the right man who will always make her happy and take good care of her as at when due. Furthermore, the wedding reception which held at Ogbe stadium (Benin City) had the attendance of prominent Nigerians in the Nigeria energy sector, like former national deputy President of Nigeria Labour Congress (NLC) and present deputy national Chairman of Labour Party in Nigeria, Dr. Joseph Akinlaja, national and state executive officers of National Union of Petroleum and Natural Gas (NUPENG), and Petroleum and Natural Gas Senior Association of Nigeria (PENGASSAN), representative of Edo State Governor, Comrade Adams Oshiomhole (immediate past NLC President), clergy men, various religious organisations, friends and family members home and abroad etc.